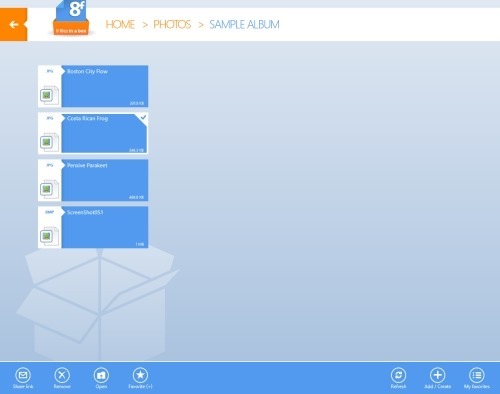 8filesinabox is a free Windows 8 Dropbox app available under the ‘Tools’ category of Windows 8 Store. 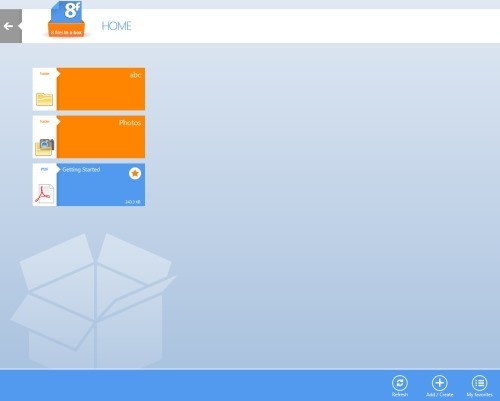 This Dropbox app for Windows 8 lets you access your Dropbox account in a full screen mode. You can add new files, pin to start frequently used files, add files to your favorites for offline use, remove files, and do everything you have been doing in the regular Dropbox account. The interesting part here in this Windows 8 Dropbox app is the amazing full screen column-based tiles interface. For the very first time when you start with the app, you will be asked to sign-in with your Dropbox account or to create one, if you do not have. As you open the app, you will find all your Dropbox files imported here in this Dropbox Windows 8 app. To add more folders, right-click anywhere on the scree ? click on Add / Create (+) sign given in the horizontal bar. As you open a folder, you will see files included in that folder. Select a file (by clicking on it) to perform various actions with it such as open it, remove it, share link of that file, add file to my favorites and more. Lets you access your Dropbox account including all your Dropbox files. Allows you to create new folders or files in the app. Lets you share links with others. Lets you add a file or folder to your favorites list. Brings you a ‘Refresh’ button to view newly added files or folders. Type the name of the app ‘8filesinabox’ and hit ‘Enter’. Proceed with it to download the app in Windows 8 system. In short, 8filesinabox is a good utility Windows 8 Dropbox app to access your Dropbox account without opening it on your desktop, time and again. Just head over to the app and access your Dropbox right away. Download 8filesinabox now.